Brrrr…. so cold today. It’s a shame I have to go to work. I just want to stay home all day, bundle up, and drink coffee (it’s very rare I get to drink coffee). What I love about fur is that it keeps me super warm. But because the cardigan is so roomy and boxy, I want to define my waist a bit. On top of my metallic sweater, I added a cocoon sweater which has the ribbed or waffle front. By belting it, I created a defined waist. In the mirror, it just makes me look fat! But when my husband snapped these shots, I was happy the look turned out the way I wanted. Illusions of the eye and all that jazz. Speaking of eye, I went to the eye doctor because my new contacts were causing me some trouble. If I look at something too quickly, my eyes would blur and then my focus would kick in. It kept happening all week and it was annoying me. But good news, my left eye got .5 better. Wow I love all the layering you did here! Wow that’s awesome about your eyes improving. My eyes have been just the same amount of blindess for over 10 years now LOL! It’s been a strange thing with my eyes. They are really bad. I don’t know how it improved. I still have massive dryness in my eyes though. (sleepless nights for the past 4 years – due to kids). Thanks! As for the photo collage, did you notice my daughter tugging my bracelets in the middle picture? 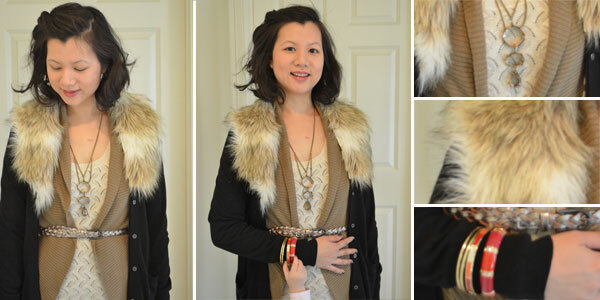 I love this look – the faux fur is fabulous! Thanks! I think fur is an essential winter item.